This picture of Darby Creek in Darby is from about 1912. As you can see, the caption is Darby Navy Yard. 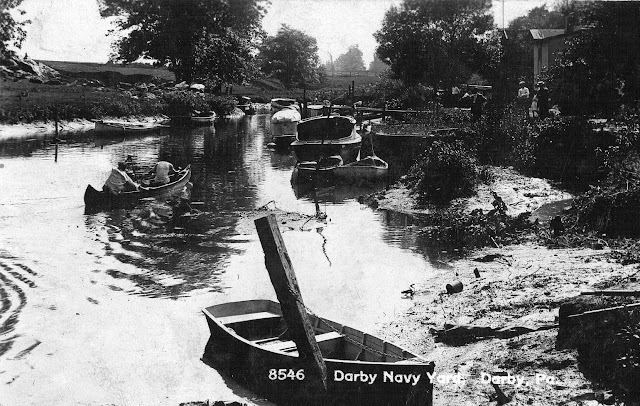 Boating on Darby Creek was very popular 100 years ago. There were also boathouses. NOTE: A fun and interesting article from 98 years ago. The Darby Mayor trying to stop Sunday Baseball Games. The mayor eventually agreed to Sunday Baseball. Warrants for the arrest of eight members of the Delco baseball team of Darby, charging then with breaking the Sunday “Blue laws,” have been issued by Magistrate William H. Robinson of Norwood. The warrants were issued at the instance of Burgess George Grayson, who, it is reported, swore to them before a Norwood Justice as a result of finding Darby Justices in sympathy with the baseball players and fans who support them. Another baseball game has been booked for next Sunday. The warrants for the arrests of the baseball players are in the hands of Fred Welsh, a Darby policeman.